Going to the cinema to watch a new release is always fun. Seeing it in 3D often adds to the excitement, though less than half way through the 3D effect seems to appear less noticeable. To make your movie going experience the best it could possibly be, it's best to watch the movie on the world's largest cinema screen at IMAX in Darling Harbour, Sydney. At IMAX you aren't just watching the film, you are engulfed by it. The screen stands at 29.42m high by 35.73m wide, covering an area of more than 1,015 square metres and fills the whole field of vision. The sound system really adds to the experience, and is a crucial aspect of watching a movie at the IMAX. Sound is delivered from a massive 15,000 watt digital surround sound system. The film soundtrack truly surrounds you as the image fills your vision, creating the feeling of being apart of the movie. Even though you are watching a movie projected on to a screen 7 stories high, IMAX boasts the clearest picture of any cinema and the most realistic 3D technology. IMAX does also show movies in 2D, not just 3D. Ticket prices at the IMAX are more than your average cinema, but this movie experience is definitely worth the extra money. For a 45-minute IMAX film adult tickets are $19.50, children (3-15) are $15 and seniors/concession/student are $17. For IMAX feature films adult tickets are $28.50, children $20.50 and seinors/concession/student are $24.50. There are family passes for 1 adult and 1 child, 2 adults and 1 child and group prices and packages. 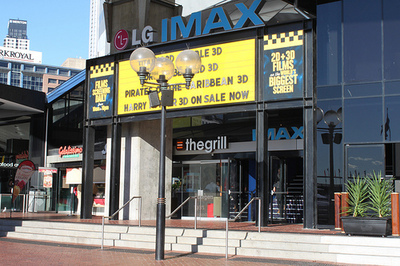 The location of IMAX is great, with 39 restaurants in Darling Harbour, you are bound to find somewhere to eat before or after the movie, and don't forget the candy bar. Enjoy a great meal, then have one of the best movie experiences of your life - sounds like a great day out, doesn't it? When: 7 days a week, 365 days a year.